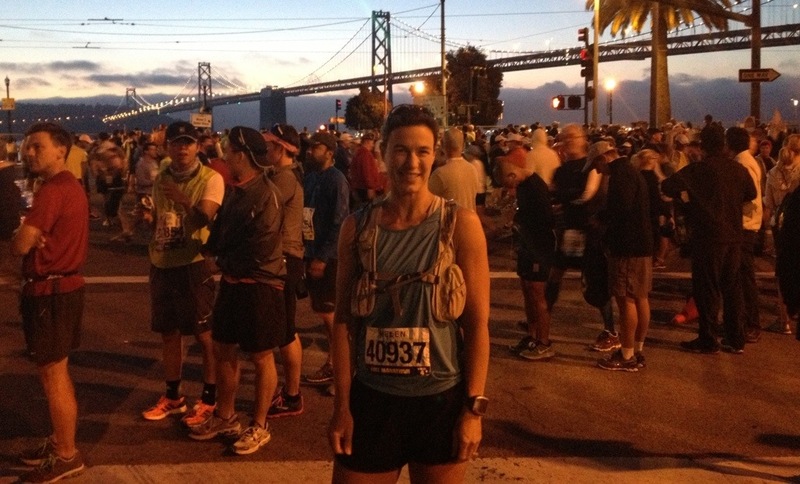 Reporting live from our fabulous date weekend at the San Francisco Marathon! Running the deck of the Golden Gate Bridge: One huge checkmark off my bucket list. No further explanation necessary! Starting and finishing at the Bay Bridge was also quite nice. 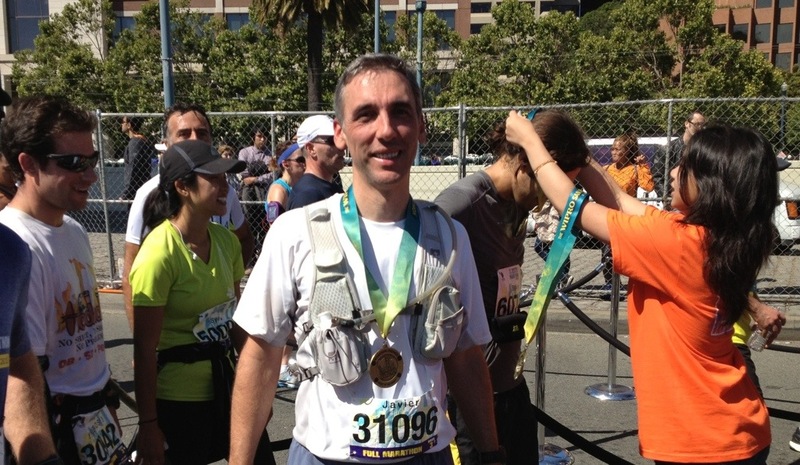 Sharing Javier’s first marathon experience: It was great to see him hit his stride and finish strong. Now I’m enjoying watching him hobble around already, and fondly remembering my own first marathon at CIM. Staying at the host hotel (Embarcadero Hyatt): I booked the room months ago and almost cancelled in favor of free housing elsewhere in the City. I’m so glad that we ended up staying here! What a luxury to stay just blocks from the start and finish of a loop course. There was no early morning bus ride and we got to sleep in until 4:15am. (I’m not being sarcastic here – it was really nice to have a “later” wake-up call.) We got upgraded to a bay view room for a nominal fee and it has really been the perfect date weekend! Running a negative split: I finally had a moment to think about my goals for the day about 3 miles into the race (better late than never). The first couple of miles I was just thinking about how much I still really enjoy a good road marathon! I had been hoping to run in less than 4 hours, just to be sure that I still could. My primary goals, though, I decided, would be to run a negative split and to run relaxed with joy. I saw a great reminder sign later on that said, “Stay calm & run.” Everything worked out and I realized around mile 23 that I could run a marathon PR (Personal Record) if I picked it up the last 3 miles. And that’s how I ran an “accidental” PR (3:52) today by one minute. Tracking and being tracked: Nine timing mats along the course provided great real-time results and estimated finish times. My parents enjoyed tracking us along the course using the free SFMarathon app. I also tracked Javier and other friends on the course after I finished. Greeting friends at the finish: The tracking app made it easy to find friends crossing the finish line. I was also utterly flabbergasted that the famous Cathal (from my rough Bizz Johnson marathon last Fall) recognized me as I was jamming along at mile 26. We both seem to have recovered from our less-than-optimal performances at Bizz. It was also fabulous to see my training buddy, Kim, finish just 10 minutes behind me, for first place in her age group! The finisher medals are actually real coasters! Enjoying fresh food from home: I fell behind on the food prep prior to our last family road trip, and really regretted it. So this time I spent Friday afternoon cooking and preparing food for us as well as the kids at home. Our pre-race dinner last night was a huge farm-fresh spinach salad with grilled chicken, followed by dark chocolate with peanut butter. This morning we fueled up with homemade tortilla de patata. 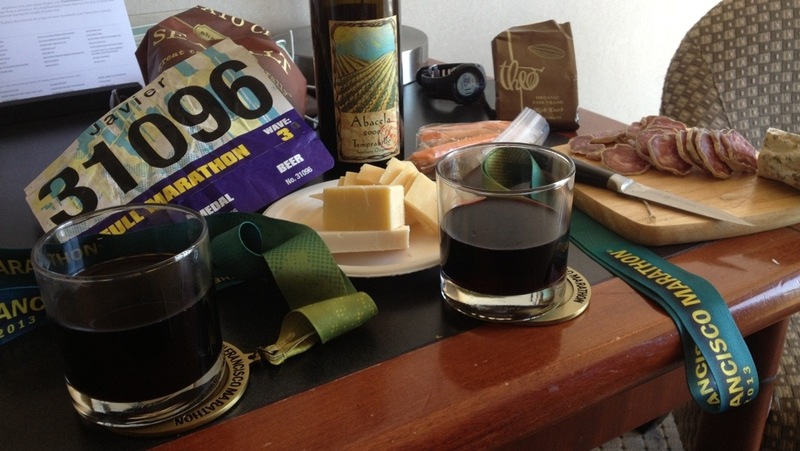 The post-race spread at the event was fairly nice, as it included chocolate milk (my favorite recovery drink!). Later we enjoyed a gourmet picnic in the hotel room, including an Abacela Estate Tempranillo that I’ve been saving for just such a special occasion. Dealing with city traffic and parking: The race organizers have tried to minimize traffic hassles by providing shuttles to the expo and also heavily promoted the use of mass transit. Nonetheless, we did drive from Truckee and needed to deposit our car somewhere. Parking at the Hyatt is a whooping $64/night! Fortunately, Javier knew where to find off-site parking for $15 for the entire weekend. Just getting into the city, unloading the car, and finally arriving at the expo was an exhausting deal. I think mountain living has greatly diminished my ability to tolerate urban centers. Paying $5.00 CASH for self-service coffee at the hotel: This was lame. As marathoners filed out of the elevators prior to the race, we were naturally looking for a quick hit of coffee. A full restaurant was open, and the host (somewhat rudely) informed us that we could find hot brew at the “grab-and-go” table. This self-service station had drip coffee for $2.50/cup, and only accepted cash (no room charges). Really, because we marathoners are walking around with wads of cash in out pockets? I actually had a $20 bill, but still find it one of those little things that great marathons and their host hotels shouldn’t screw up. Furthermore, much less expensive hotels across the country offer morning coffee for free. If not all the time, at least they could splurge for race morning. Lots of highlights and not many complaints… it has been a great weekend and it’s not over yet! The weather is lovely and we are off to the Ferry Building to shake out our legs… OK, I guess there are some positives to city life! It has been a fun diversion, but I can’t wait to get back on dirt… Wednesday!! Glad to hear you had a good experience in San Francisco, I’ve heard both good and bad about that race. Amazed at your hotel coffee difficulties. It seems like even crappy hotels have free coffee, let alone Hyatts in big cities. I wonder what kind of problems they’ve had that they have to charge like that? Also: great race. Unexpected PRs are awesome. Nice to hear from you! I hope you’re having a great running season! Congratulations on your negative split and PR. Perhaps you figured out how to run wisely in the beginning to finish strong in the end…like you did at TRT a week ago? See you on the dirt real soon!